Unit 1. 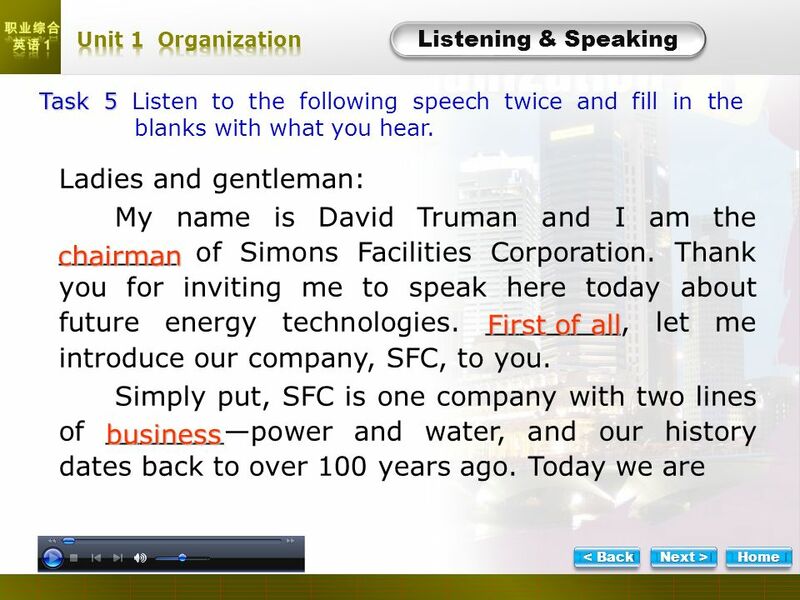 Listening & Speaking Task 1 Task 2 Task 3 Task 4 Task 5. 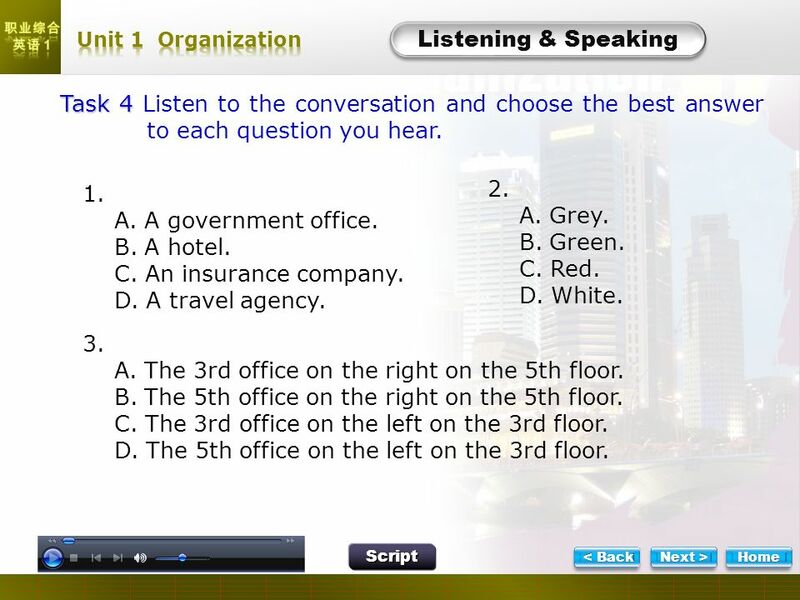 9 L- Task 4 Task 4 Task 4 Listen to the conversation and choose the best answer to each question you hear. 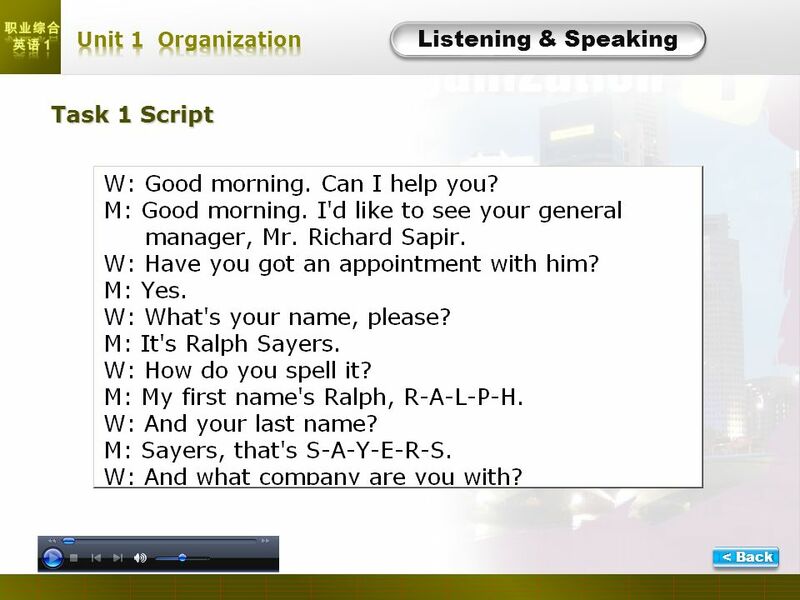 Listening & Speaking Script 1. A. A government office. B. A hotel. C. An insurance company. D. A travel agency. 2. A. Grey. B. Green. C. Red. D. White. 3. A. The 3rd office on the right on the 5th floor. B. The 5th office on the right on the 5th floor. C. The 3rd office on the left on the 3rd floor. D. The 5th office on the left on the 3rd floor. 13 Oral Practice Work in pairs. 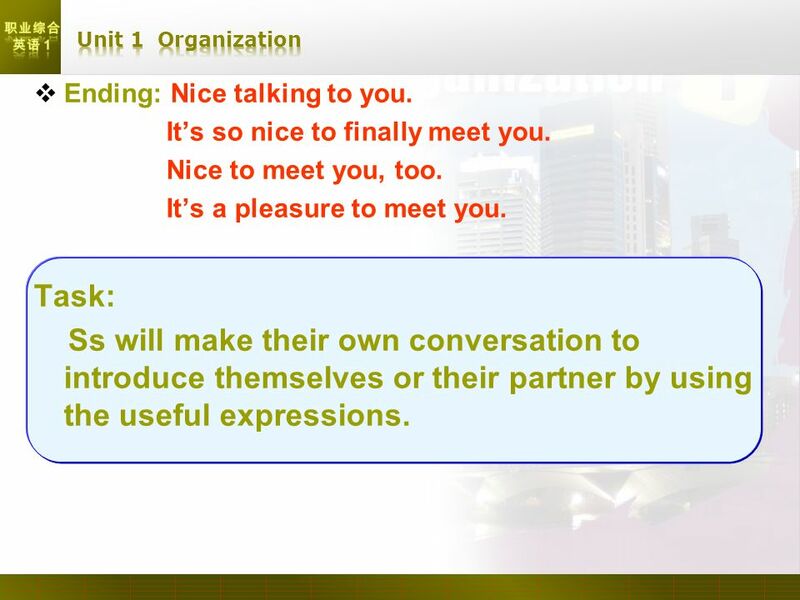 Introduce yourself to your partner and ask questions about him/her with the useful expressions. Then complete the chart bellow. 1. Name Q:____________________________________________ 2. Hometown Q:____________________________________________ 3. Hobbies Q:____________________________________________ 4. Spare-time activities Q:____________________________________________ Whats your name? Where were you born? What do you usually like to do ? What do you do in your spare time? 14 5. Reasons for studying his/her major Q:_____________________________________________ 6. Your own questions: Q:_____________________________________________ _____________________________________________ Why did you choose this major? What s your impression on our campus? Whats your plan for the new term? Whats your favorite food? 15 Useful Expressions Greetings: How do you do? Ive often heard about you. Ive heard so much about you. Making introduction: Allow me to introduce myself. My name is… Im…, from… Asking questions: Where were you born? What do you do in your spare time? Did you grow up here? Why did you choose this major? 16 Ending: Nice talking to you. Its so nice to finally meet you. Nice to meet you, too. Its a pleasure to meet you. 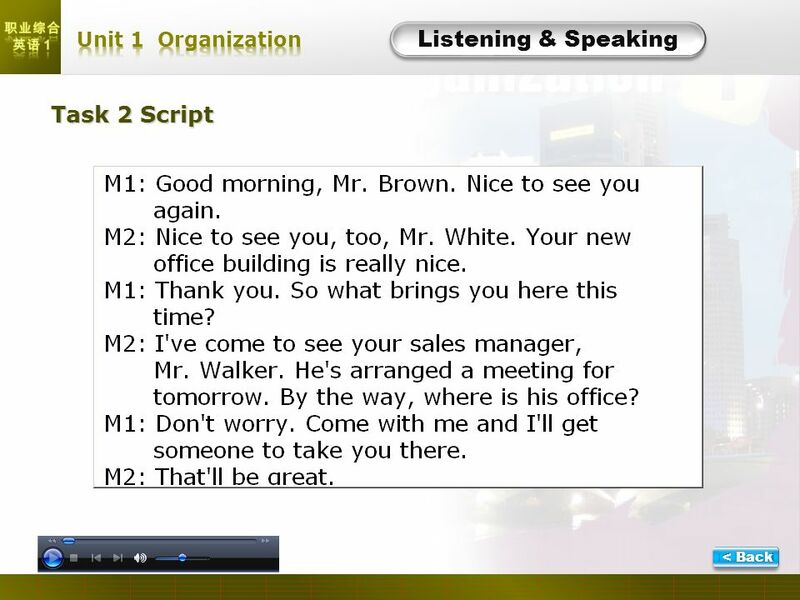 Task: Ss will make their own conversation to introduce themselves or their partner by using the useful expressions. 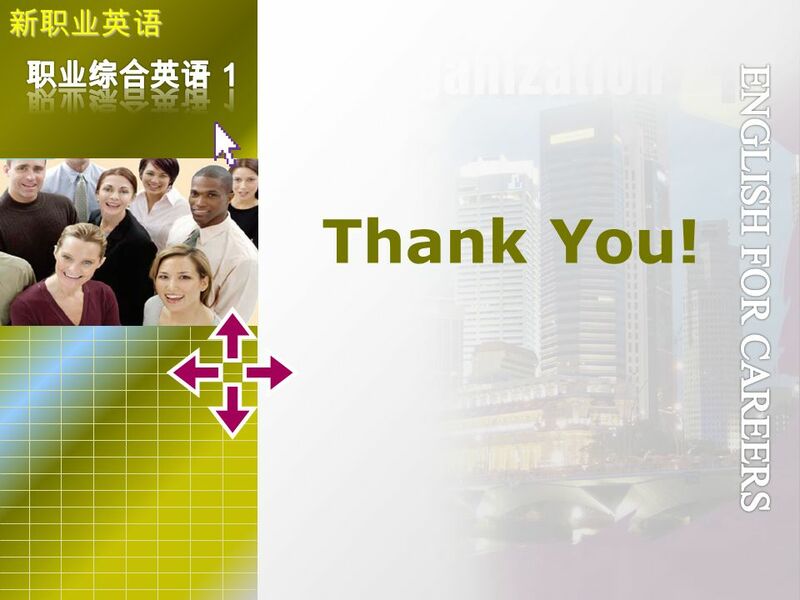 Download ppt "Unit 1. 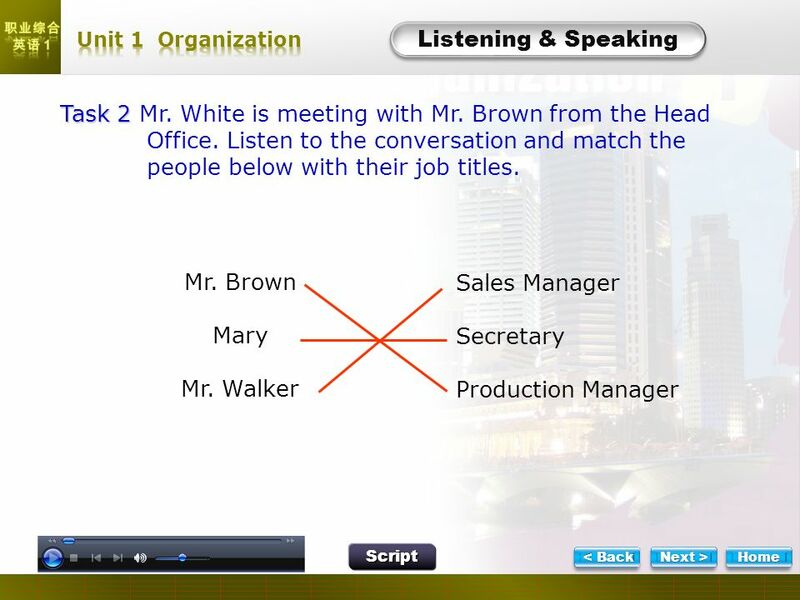 Listening & Speaking Task 1 Task 2 Task 3 Task 4 Task 5." Dialogue 3 Words and Expressions Fill in the blanks with the missing sentences Decide the statements true or false Dialogue 2 Words and Expressions Ask. Unit 3. 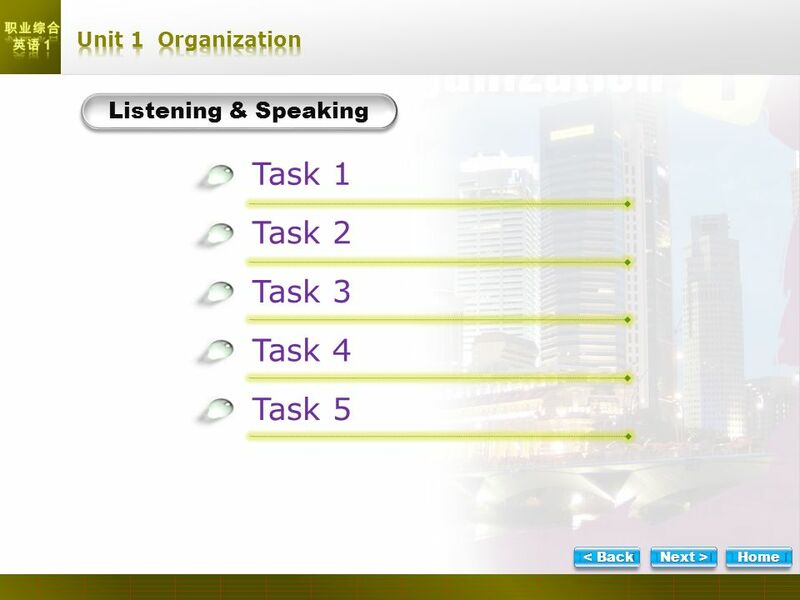 Listening Listening & Speaking Task 1 Task 2 Task 3 Task 4 Task 5. Lead-in SEATS ARRANGEMENT All students of Class 2, please sit by your student number, 10 numbers a group (e.g. group 1: No 1-10; group2:No11-20…) the class. Greeting and Introduction By Thidawan Wichanee. Listen and Watch Take notes Please! What are the similarities in these two dialogues? 14 th meeting. On behalf of Company I would like to welcome you here today. My name is Max Mustermann and I am the CFO of Global Travel. Hi, I'm Max and. Unit 2 How do you spend your day?. Warm up 1) make eyes at sb. A: Did you just make eyes at John? He’s my boyfriend. B: Mary, you are so jealous! Listen and Watch Take notes Please! What are the similarities in these two dialogues? November 24, 2009 Topic: “Work” Language focus: Modal verbs to talk about abilities (present, past & future) Collocations with make & do Vocabulary: jobs. BAHASA INGGRIS 2 By: Selvianti, S.Pd. 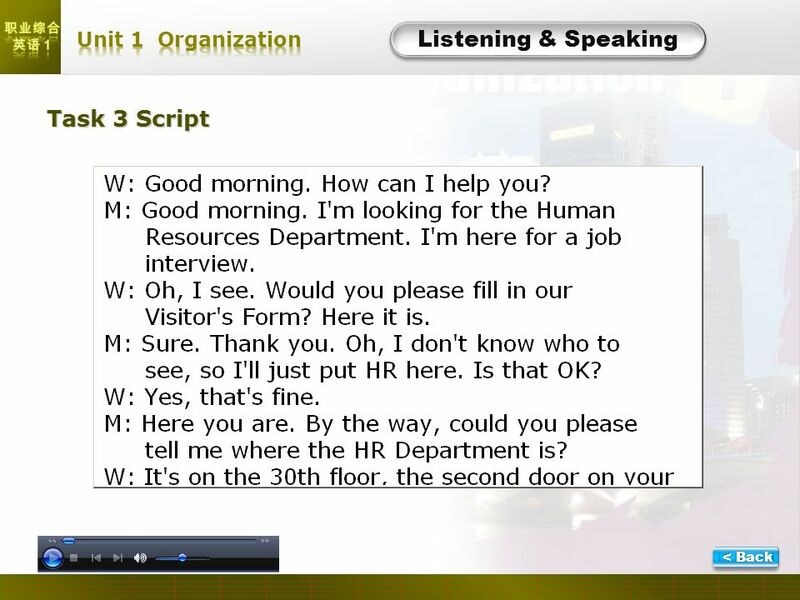 2 Unit 1: INTRODUCTION We usually greet our friends when we meet them or when we talk to them on the telephone. Receiving Visitors. 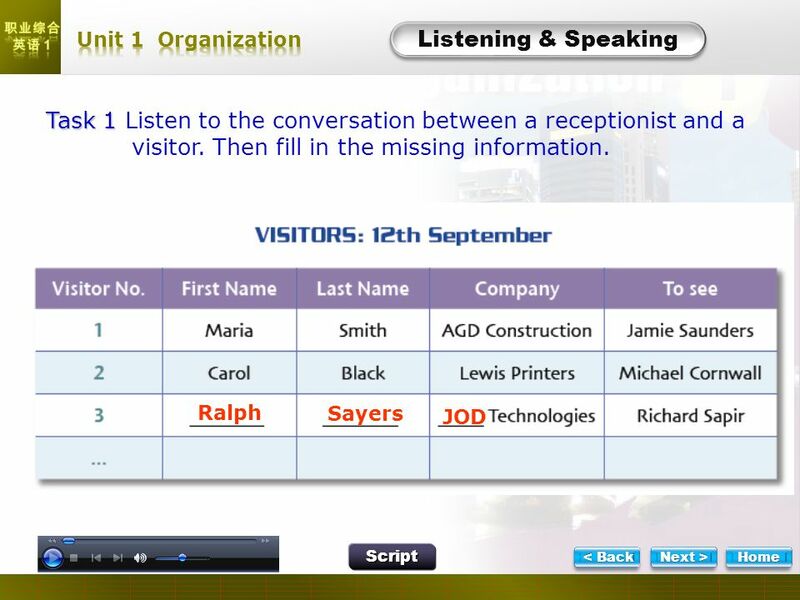 Viewing, Listening & Speaking OBJECTIVES ★ understand the procedures involved when receiving business visitors ★ receive business. You can say “Hi” to people you know well and “Hello” to people you’ve just met or to seniors. 5. U n i t 3 : P E O P L E ’ S B A C K G R O U N D W R I T I N G.
Main. 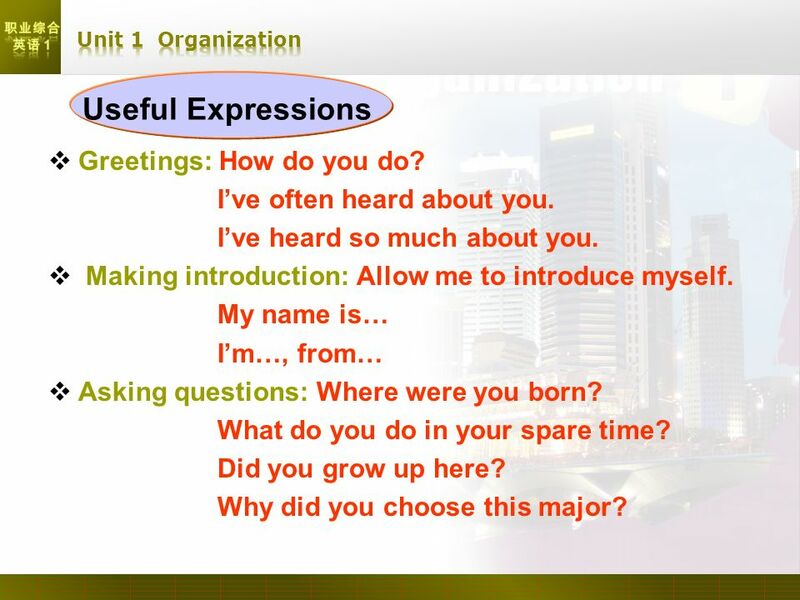 unit1 In the neighborhood Lesson A Meeting new peopleLesson B Describing yourself and others 1. Vocabulary Link first name languages age city interests. 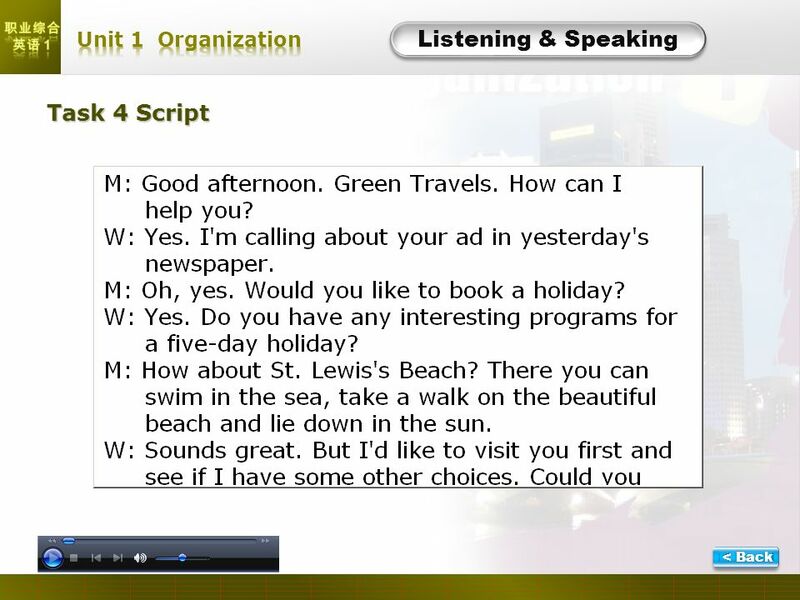 Business English ---Listening and Speaking course.